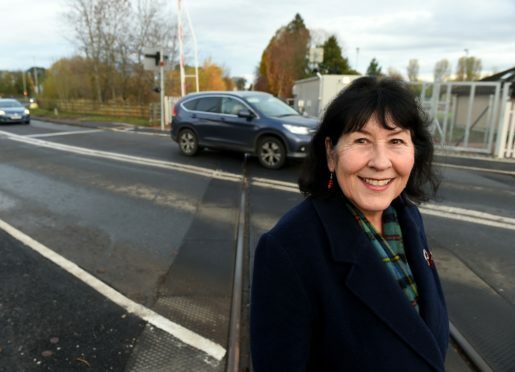 Highland Councillor Margaret Paterson with the now completed Dingwall Middle crossing. Engineers from Network Rail are upgrading both Dingwalls’ middle and number one crossings to full barriers, in a bid to improve safety for motorists, pedestrians and train passengers. The middle crossing, located just yards from Dingwall Academy on Newton Road, has traditionally been protected by one single barrier; meanwhile number one on Craig Road has remained an open crossing with no barriers. As part of the £3.5million works, both crossings will now be equipped with traffic lights, two single lane barriers on each side and an object detection system which scans the line to check it’s clear for approaching trains. She said: “It’s absolutely crucial. I have been asking for gates on these crossings for over 20 years and they put on the half barriers which helped quite a bit. “I am absolutely delighted; safety is paramount. Hundreds and hundreds of vehicles go through these crossings, not counting the pedestrians including children. The secondary school has over 1,000 pupils and lies right next to the middle crossing. “The lights have failed on a number of occasions. There weren’t any lights, so people weren’t aware the train was coming. When that happened on occasions, people just drove over and the next thing a train was coming. The fright you get stays with you for a long time; it’s really scary for the driver of the train as well as the people sitting on the train. The works have been conducted following a series of close calls and trespassing incidents on both areas of the line. The Craig Road crossing will now remain closed until 5am until November 26 to enable the essential works to be undertaken.